As someone who enjoys meandering through old cemeteries, gazing at tombstones and wondering about the people who lie below, I was excited at the prospect of an entire book about obituaries. 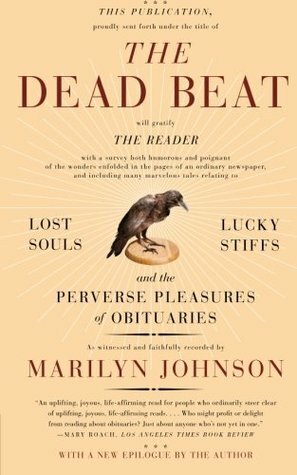 Author Marilyn Johnson focuses not so much on interesting obituaries themselves but on the craft of the creative obituary writer. A self-proclaimed obituary fan, Johnson shares fascinating insights into the writing process: from research to publication. When I worked for a local newspaper, about a decade ago, we followed a very different process. Except for a few high-profile local celebrities, which entailed front-page feature stories, most obituaries were dictated to us by the local funeral home directors. But as Johnson relates, the art of creative obituaries has become more prominent in recent years. Johnson interviewed a host of talented obituary writers, and when she relates their stories, the book is engaging. Too much of the book, however, concentrates on Johnson's own stories about seeking out other obituary fans. The end result is an information-packed book that lacks focus. She should have emulated her favorite obit writers, who distill an entire lifetime into 1,000 words. Sign into Goodreads to see if any of your friends have read The Dead Beat.